Welcome to another week here at the ole leg of iron. The tune I bring you this fine day is one that I first heard not in its original version, but in a cover by one of the most successful commercial folk acts of the 1960s. Peter, Paul and Mary were hugely successful in their day, and unlike so many of their contemporaries managed to be so without sacrificing all of their folk movement cred. Some of this was the result of their activist bent, and some due to the fact that they managed to maintain a level of musical and artistic quality, rarely pandering to the middle of the road. I know some people would disagree, but I won’t hold PPM’s efforts to be entertaining against them. They are often remembered today as representative of “commercialized” folk music, but this is usually by people that forget groups like the Kingston Trio. Their LP ‘A Song Will Rise’ was a cornerstone of my father’s record collection (the small, non-jazz contemporary wing thereof) and as a result a major formative touchstone for yours truly. The album featured some cool originals but also some exceptional cover material, such as the Weavers stirring ‘Wasn’t That a Time’ and the song I bring you today. 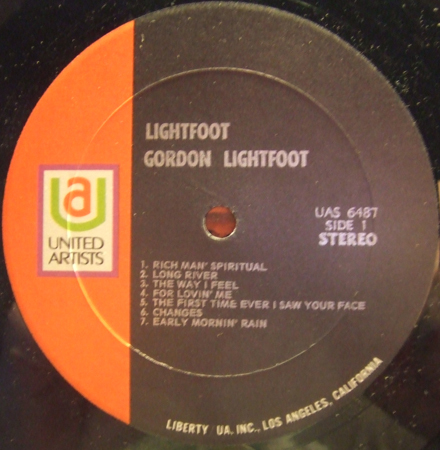 Naturally, when I was a tot I had yet to discover the value of reading record labels, so I was unaware that ‘For Lovin’ Me’ had been written by Gordon Lightfoot. Oddly enough, I know who Lightfoot was, but only because by that time he had already entered the pop charts a number of times with songs like ‘If You Could Read My Mind’ (1971). It wasn’t until decades later, when I picked up Lightfoot’s 1965 debut that I realized that the song I loved so much as a kid was a cover. Of course by that time, I’d read and listened to enough that I was familiar with his early work as a songwriter, with material being recorded by artists like Nico (‘I’m Not Sayin’), Judy Collins (Early Mornin’ Rain) and Marty Robbins (Ribbon Of Darkness). Much like his countrywoman Joni Mitchell, many of his most famous songs were recorded (or were popularized) by others first. 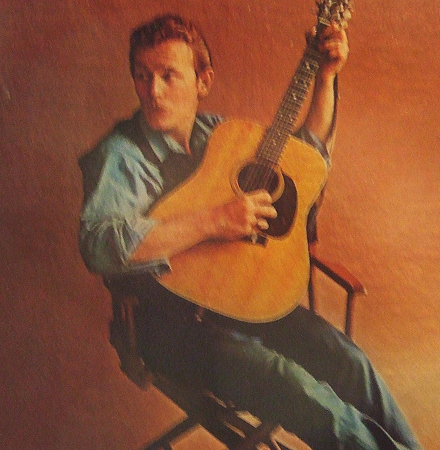 Lightfoot got his start as a folksinger/songwriter in his native Canada having chart success in his native country and doing TV work in the UK before being signed by none other than Albert Grossman in 1965 and recording his debut album for United Artists the following year. Though the record was acoustic, in the folky tradition, the songs and performances had the sound not of a coffeehouse troubadour but rather an early iteration of the singer/songwriter vibe that would become huge over the next five years (much like Tom Rush during the same period). ‘For Lovin’ Me’ is a great, slightly dark feel to it with some haunting chord changes. Though I’ll always love the harmonies in the PPM version it’s also cool to hear the song delivered in Lightfoot’s rich baritone. The ‘Lightfoot’ album has been reissued, but oddly enough original copies tend to turn up fairly frequently. You not only get to hear Lightfoot’s versions of his own songs but covers of tunes by Phil Ochs (Changes), Ewan McColl (The First Time Ever I Saw Your Face) and a cool take on Hamilton Camp’s ‘Pride of Man’ which would later be covered by Quicksilver Messenger Service. I hope you dig the tune and I’ll see you all next week. I have gone on the record in this space previously of my deep and abiding love for the song ‘I Can’t Let Go’. I posted the Evie Sands OG a while back and the Hollies cover (which hit the Top 40 in 1966) is a positively brilliant pop record. Some time a few years back I was digging somewhere and picked up the record you see before you today because it included a cover of that very song. I knerw nothing about Nobody’s Children, other than the fact that there were clearly several bands working under that name during the 60s. Maybe not as many as there were Mods, but certainly a few more than there were Driving Stupids. That said, when I got the 45 home I discovered a delightful updated on the Hollies model, with the band taking an upbeat approach to the song with the extra added attraction of a horn section. As it turns out, this particular group of Nobody’s Children were a Washington, DC area group that got their start as Adam’s Apples before hitting locally with their cover of the Al Gorgoni/Chip Taylor classic. 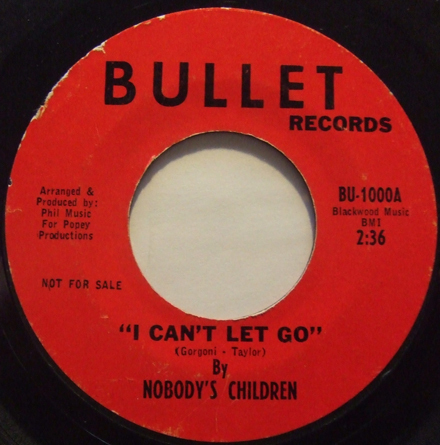 Released first on the Bullet label (two different pressings, the one you see here and one with red and white spiral design) in 1967, ‘I Can’t Let Go’ was picked up for national distribution by the Buddah label in 1968 where it met with some regional success on the East Coast. There’s an interview online with DC area DJ Harv Moore that seems to suggest that this is the same group that recorded for United Artists as well. That said, it is most groovy cover of a great song, something that is always worth stuffing into your ears. Welcome once again to the Iron Leg Radio Show. This time out we have some very groovy new arrivals, including some great examples of late period Nederbeat (Neder-Freakbeat? ), trippy folk rock, long-form Traffic jam, Murray Wilson madness, pop-soul, garage punk, sunshine pop and a couple tracks pulled out of left field. As always, I hope you dig it (and if you do, check out the previous 11 episodes in the archive) and I’ll be back next week with something cool. Welcome to another week here on the good ship Iron Leg. Fairport Convention, long one of my favorite groups is one of those late-60s UK bands that deserves a lot more respect than they get from rock/psyche heads. Though they are best known for their rural, folk-rocky travels, with the Morris Dancers and the twenty-sided dice and what not, what they started out as, and what they did best (at least on my opinion) was make some superb rock music. That the band was at their peak a veritable Murderers Row of UK talent, with the almighty Richard Thompson wrangling the guitar and writing some brilliant songs, Sandy Denny (preceded by Judy Dyble, the Signe Toly Anderson of British rock) and Iain Matthews on vocals, Ashley ‘Tyger’ Hutchings on bass, Simon Nicol on rhythm and Dave Mattacks (himself preceded by Martin Lamble) on drums, Fairport made their mark as part of the UK underground, taking a sort of Jefferson Airplane-ian vibe and wrapping it in the Union Jack. Though many seem to think that the UK rock scene of the day was solely the playground of laughing, treacle coated gnomes, there was a strong undercurrent of a West Coast US influence at work. The group’s first four albums, recorded between 1967 and 1969 are as solid a block of great music as was made in those heady days. ‘Fairport Convention’, ‘What We Did on Our Holidays’ and ‘Unhalfbricking’ can stand proudly alongside just about anything released during those years. Unfortunately, after the third album, the band’s van overturned, killing both original drummer Lamble, and Richard Thompson’s girlfriend Jeannie Franklyn. 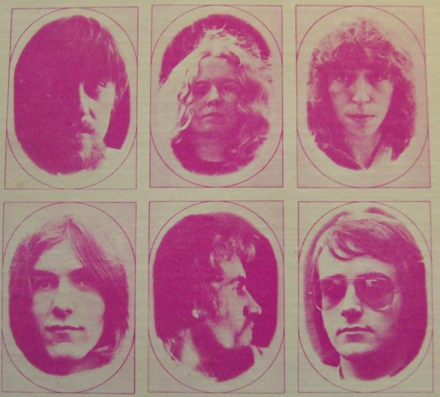 The band went into a period of seclusion and inactivity (with Matthews leaving to start Matthews Southern Comfort), after which they gathered to regroup. It was during this period that they were joined by fiddler Dave Swarbrick and began to morph into the more folky Fairport of the 70s. 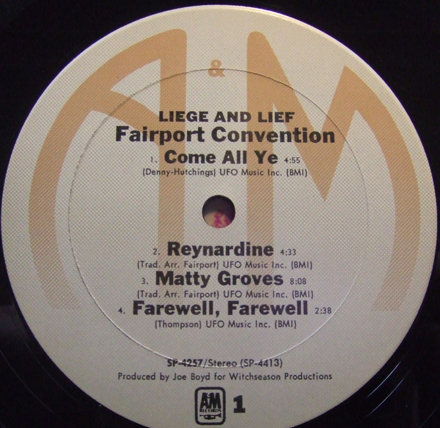 The album that resulted, 1969’s ‘Liege and Lief’ is an important transitional artifact joining the earlier, psyched out Fairport with the later, traditionalist incarnation of the band. The album is uniformly superb, but in my eyes (and ears) its finest track, and in many ways the linchpin on which their evolution turned, was ‘Reynardine’. A reworking of an old traditional song that dates to the late 18th century (it had apparently migrated to the US by the 1830s), ‘Reynardine’ is the tale of a mystical creature that could metamorphose into a fox and lure maidens back to its castle. It sounds like the kind of thing Led Zeppelin might have tackled in the depths of their Tolkien worship (which intersects with this era of Fairport in style, as well as in the borrowing of Sandy Denny for Led Zep IV), but Fairport manage to turn it into a hypnotic, almost completely drumless meditation. It is in turns psychedelic, bucolic – it is hard to listen to it without passing back and forth between visions of hippies standing barefoot in the mud, and pre-Victorian peasants…standing barefoot in the mud) – floating along like a ghost on the pure air of Denny’s voice. The song is almost over before you realize it. The sensation is almost as if you’d been caught eavesdropping on some unspeakable, mystic invocation. Unlike their epic reading of another traditional tune, ‘A Sailor’s Life’ from ‘Unhalfbricking’ (which also featured Swarbrick, then just a sideman) ‘Reynardine’ never really takes off into an era-appropriate jam (as you might expect) choosing instead to reserve its powers (yet managing to be more powerful still). It’s the kind of performance that leaves the listener convinced that they’ve heard traces of something bigger floating in the background. It is every bit a version of an old traditional song, and at the same time anchored firmly in 1969. Though I respect the later Fairport, I must admit that there are times where they go all jolly-fiddler and fill the mind with images of dancing elves and alewives, which is cool if that’s your thing, but ‘Reynardine’, and all of ‘Liege and Lief’ manages to be so heavy precisely because they only hint at what would soon come to the fore. If you haven’t given their early stuff a listen because you were put off by the whole RenFaire bag, then you are doing yourself (and them) a grave disservice. Fairport Convention were a great (not merely good) band. Late last week I was slacking in front of the TV set and one of my fave guilty pleasures, the 1968 film ‘Where Angels Go Trouble Follows’ came on TCM. It’s not a particularly fantastic movie, but it does carry with it a great flavor of the times, as well as the confusing spectacle of the unbearably hot Stella Stevens dressed as a nun. What it also has is the outstanding title song by Tommy Boyce and Bobby Hart. Boyce and Hart are remembered mainly as the guys that wrote so many cool songs for the Monkees back in the day, or (mainly by women that were teenyboppers during the mid-to-late 60s) as slightly aged teen idols. 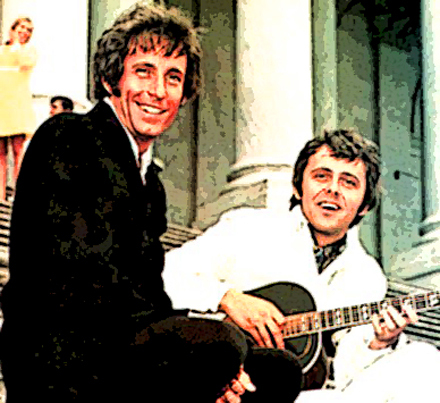 Though they’re probably more famous for writing songs like ‘Last Train to Clarksville’, the duo recorded some excellent records of their own, like the brilliant ‘Out and About’ (from 1967, covered in this space a few years ago) which they performed on an episode of ‘I Dream of Jeannie’. A few years later, they would perform one of today’s selections on another popular sitcom. Oddly enough, I didn’t originally know of ‘I’m Gonna Blow You a Kiss In the Wind’ as a Boyce and Hart song, having first heard it covered on the 1984 Redd Kross LP ‘Teen Babes From Monsanto’. I was actually lucky enough to see Redd Kross perform the song live a few years later. When I finally picked up a copy of the Boyce and Hart original (and saw the episode of Bewitched that contained the song) I was pleased to discover that I dug the OG even more than the cover. The Bewitched episode includes two performances of the song, one by Elizabeth Montgomery as ‘Serena’ and again by Boyce and Hart. 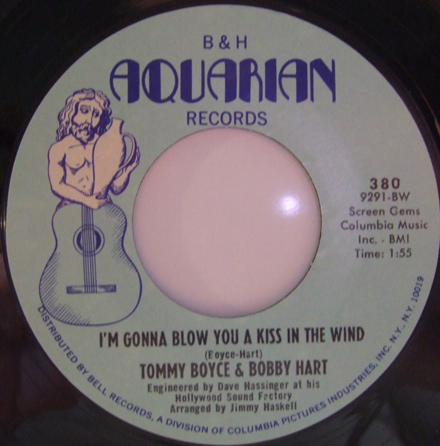 The Boyce/Hart ‘I’m Gonna Blow You a Kiss In the Wind’ was the last 45 they released as a duo (in the Fall of 1969). Though the record has a bubblegum heart, the delivery is a little harder edged than most of that genre and has an excellent arrangement by Jimmie Haskell. The single is also notable for carrying with it a most excellent B-side with ‘Smilin’. Despite the fact that both sides of the single were top notch pop, neither song made even a minor dent in the charts. I hope you dig both tunes, and I’ll be back next week.